In 2011, environmentalists won the worlds largest judgement against Chevron (holy moley $18 billion), but it turned out it was all based on fraud, fake witnesses and telling lies. Who would think people who say they like trees and human rights would be so self serving? The award has since been overturned — indeed the tables have turned, and last week Chevron was awarded $38 million in damages. Strangely, bad behaviour of planet-saving-people doesn’t appear to rate highly in the news. Hands up who thinks the BBC/ABC/CBC would fail to mention it if environmentalists won a $38m suit against a money-laundering-witness-tampering oil company? [May 25th, 2018] SAN RAMON, Calif.–(BUSINESS WIRE)–May 25, 2018– The Supreme Court of Gibraltar has issued a judgment against Pablo Fajardo, Luis Yanza, Ermel Chavez, Frente de Defensa de la Amazonia (the “Front”) and Servicios Fromboliere for their role in a conspiracy to procure and attempt to enforce a fraudulent Ecuadorian judgment against Chevron. The court awarded Chevron Corporation$38 million in damages and interest and issued a permanent injunction against the defendants, preventing them from assisting or supporting the case against Chevron in any way. Donziger and Fajardo, an Ecuadorian lawyer, were found by a U.S. Federal Court to have engaged in extortion, money laundering, wire fraud, Foreign Corrupt Practices Act violations, witness tampering and obstruction of justice. The Front, which has long been involved in peddling a dishonest public relations campaign against Chevron aimed at extorting a settlement from the company, and Servicios Fromboliere, an Ecuadorian law firm established by Fajardo, are both shareholders in Amazonia and part of the extensive web of obscure entities established by the participants in the fraud against Chevron to attempt to hide their misconduct and profit from it. Haven’t heard about it?? Funny. The same media that reported endlessly on the so-called “pollution” went pretty quiet when the case turned out to be a fraud. And a load of Hollywood celebrities who helped promote the fraud have also gone very quiet recently. Yes I’m talking about you Sting, Mia Farrow and Danny Glover. The play shows how the plaintiffs, led by Donziger, bribed the judge and ghost wrote the judgment that awarded them this massive amount. And they were helped on their fraud by a cheerleading media that reported the allegations as fact but have been silent as the truth was revealed. In one of the most outrageous examples, Donziger secretly fought and stopped the Ecuadorian government from cleaning up their pollution because it wouldn’t look good for his case. Donziger was also going to become very rich in the process. He stood to pocket $1.2 billion before the fraud was uncovered. 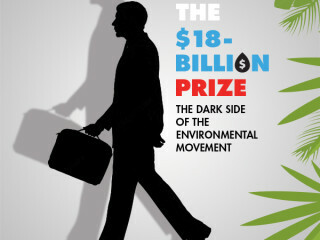 “The $18-Billion Prize reveals a dirty secret that many environmental lawsuits are frauds based on outrageous claims and sometimes outright lies and that the media are little more than stenographers for these liars,” McAleer said in an email. You can support the play or go see it in San Francisco — click here for info. Where are the media? The last story on “Donziger” on the BBC was 2014. The last story on Donziger on the ABC was never, though it did find time to report the fraudulent case in 2011 “Ecuador orders Chevron to pay $8.6b” and “Chevron ordered to pay for Amazon damage“.